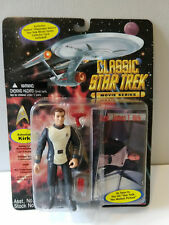 STAR TREK, MOVIE SERIES, ADMIRAL KIRK, AS SEEN IN "STAR TREK: THE MOTION PICTURE," WITH EXCLUSIVE SKYBOX PLAYMATES DELUXE STAR TREK MOVIE SERIES COLLECTOR CARD, PLAYMATES, 1995, MINT ON CARD. Card is in good condition, with minor wear & tear, and has never been opened. Free shipping is for USA only! INTERNATIONAL BUYERS: Please use ebay's Global Shipping Program. PayPal only. ADMIRAL WILLIAM RIKER. as seen in TNG finale "All Good Things.". STAR TREK THE NEXT GENERATION. Excellent Condition - Loose & Complete w/all Accessories & Display Stand. All Parts included. See Photos for complete condition. Look for my other Toys. Condition is used but very good. !!!!! !Hey Everyone and thanks for looking!!!!!! You are bidding on a custom Playmates brand Star Trek figure. This is Number One from The Cage who has risen to the rank of Commodore. The figure is loose and is for display. I only accept Paypal. Will combine shipping on multiple figures. Please read item description and pictures and e-mail me with any questions. Thanks for looking. Please check out my Facebook page I recently created. It can be found at JH Custom Figures on Facebook. I have been doing figures for years and am showing pictures of some past creations, including some that are from my personal collection that I have never sold. I would appreciate it! Small dent in bottom center of plastic (from inside out). Plastic is fully sealed to card. Price sticker on card. Includes the Quartz Dagger treasure, treasure chest, digging tool, map, coin #5 and the box. CONDITION: Loose, mint and complete. ALL ORIGINAL MOOSE TOYS. 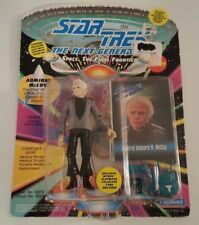 STAR TREK, THE NEXT GENERATION, ADMIRAL MCCOY, PLAYMATES, 1993, MINT ON CARD. Card is in good condition, with minor wear & tear, and has never been opened. Free shipping is for USA only! INTERNATIONAL BUYERS: Please use ebay's Global Shipping Program. PayPal only. This is Kruge from Star Trek. My Apologies in advance. Our price is our price. Nothing hidden. Slight wrinkles on card. No paint errors. Stored in temperature controlled, light-free conditions. There is a dent in the bubble of Kirk. We apologize in advance for this inconvenience. Authentic Product. Mint on card. No paint errors. Stored in temperature controlled, light-free conditions. Using the zoom feature for the pictures will show you more detail. Collectible with little or no signs of wear. Plastic has a small hole on the top corner. BIN383 (199)x. You're looking at a Playmates Admiral Leonard McCoy. It is from Series 2 complete with accessories and Skybox Collector Card. Made in 1993 by Playmates. ADMIRAL WILLIAM T. RIKER. SERIES FINALE episode. I will get back to you as soon as I can. International orders will be cancelled. “ALL GOOD THINGS". _gsrx_vers_841 (GS 7.0.16 (841)). From a smoke free collection. From The Star Trek Next Generation character family collection. My Toys DO NOT have price stickers on them. Nice and clean. Very accurate likeness to the actors as well. Made byPlaymates in 1993. Plastic may be dirty with minor dings/dents. Admiral Kirk. Classic Star Trek. Includes phaser type 2, tricorder, action base. Condition: Unused. Sticker on front. NO EXCEPTIONS. We have provided the best quality and quantity of image that we are capable of providing. NO OTHERS ARE AVAILABLE. This represents over 40 years of collecting being scattered to the internets.hope you enjoy! He is complete with all part and is in excellent condition with tight joints and little to no play wear. These were produced by Playmates Toys from the early to mid 1990's. Star Trek Admiral William Riker.